"Absinthe makes you crazy and criminal, provokes epilepsy and tuberculosis, and has killed thousands of French people. It makes a ferocious beast of man, a martyr of woman, and a degenerate of the infant, it disorganizes and ruins the family and menaces the future of the country". Absinthe is historically described as a distilled, highly alcoholic (45–74% ABV / 90-148 proof) beverage. It is an anise-flavoured spirit derived from botanicals, including the flowers and leaves of Artemisia absinthium (a.k.a. "grand wormwood"), together with green anise, sweet fennel, and other medicinal and culinary herbs. Absinthe traditionally has a natural green colour but may also be colourless. It is commonly referred to in historical literature as "la fée verte" (the green fairy). Although it is sometimes mistakenly referred to as a liqueur, absinthe is not traditionally bottled with added sugar, and is therefore classified as a spirit. Absinthe is traditionally bottled at a high level of alcohol by volume, but is normally diluted with water prior to being consumed. Absinthe originated in the canton of Neuchâtel in Switzerland in the late 18th century. It arose to great popularity as an alcoholic drink in late 19th- and early 20th-century France, particularly among Parisian artists and writers. Owing in part to its association with bohemian culture, the consumption of absinthe was opposed by social conservatives and prohibitionists. Ernest Hemingway, Charles Baudelaire, Paul Verlaine, Arthur Rimbaud, Henri de Toulouse-Lautrec, Amedeo Modigliani, Vincent van Gogh, Oscar Wilde, Aleister Crowley and Alfred Jarry were all known absinthe drinkers. Absinthe has often been portrayed as a dangerously addictive psychoactive drug. The chemical compound thujone, although present in the spirit in only trace amounts, was blamed for its alleged harmful effects. By 1915, absinthe had been banned in the United States and in much of Europe, including France, the Netherlands, Belgium, Switzerland and the Austro-Hungarian Empire. Although absinthe was vilified, it has not been demonstrated to be any more dangerous than ordinary spirits. Any psychoactive properties attributed to absinthe, apart from that of the alcohol, have been much exaggerated. 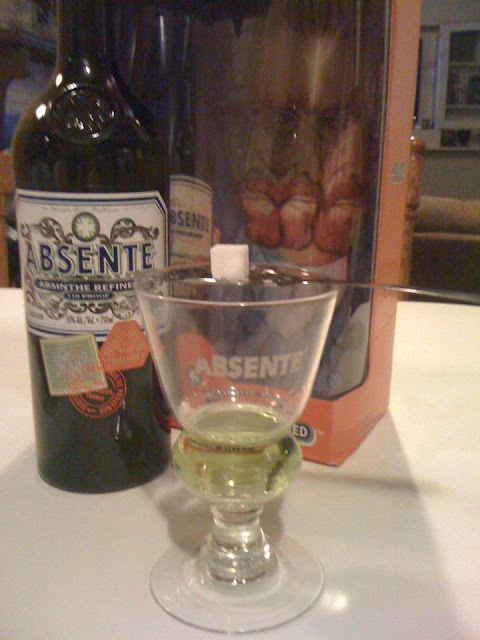 Absinthe without Wormwood is like Near Beer, just sort of pointless. So, I've been lovingly looking at the beautiful gift packs of Absente in The Liquor Store for weeks but feeling depressed because of the (reportedly) shortage of sugar cubes. Tonight, I got the call from Jenifer, my daughter, she had found my sugar cubes (Walmart, dur). That was the deciding factor, I bought the Absinthe. I am now into my fifth glass and, I must say, it is a rather "heady" high. It seems to be a social drug, but on a small scale. I can see that sharing a bottle with a like-minded friend with some good conversation would be pleasant, whereas, sitting in a bar with an obnoxioulsy loud juke-box blaring the most current mindless tripe into your cerebreum would probably be miserable and may drive a weaker individual to suicide. It is anise based, so it has a flavor reminiscent of black jelly beans or licorice. If you don't like this flavor, Absinthe is probably not for you. There is a ritual that goes with drinking Absinthe, that's where the sugar cubes come in. You need to get ahold of a gift set with a glass and an Absinthe spoon. I bought the Absente brand, which is 110 proof, or 55% alcohol. The glass that I have has a bulb shape on the bottom which holds approximately two ounces of the precious fluid, which is the proper amount for your drink. After pouring the Absinthe into the glass, lay the spoon across the top of the glass and place the sugar cubes on the spoon (I prefer two cubes). I know that, at least in one popular movie, the sugar cubes are set on fire. I have it on good authority that this can lead to disatrous results (thanks for the heads-up Clay) so, even though sorely tempted, refrained from setting anything on fire. Pour three ounces of cold water over the sugar cubes to dissolve them into the drink. It should turn a light murky greenish color, sort of like lemonade. After the sugar is dissolved, stir the mixture with the spoon, sip, repeat as needed. I am currently eight glasses into this experiment and have been feeling the effects since the very first glass. Although there have been no noticeable hallucinations, I noticed that my ability to speak with clarity had diminished by the second glass and typing this has been riddled with backspaces. It also, apparently, has time-travel qualities. I've been drinking for about two hours but my watch says that five hours have passed. Curious. I will have to invesigate this further. I will also have to update this blog at the completion of the experiment to inform about after-effects. Okay, here's the "morning-after" update. No hangover, no more lethargy than normal. All systems seem to be "go". It was a very pleasant high with no negatives as far as I can tell. Mellow. "Absinthe has a wonderful color, green. A glass of absinthe is as poetical as anything in the world. What difference is there between a glass of absinthe and a sunset?" If you'd like to really get into some Absinthe and don't mind spending a little, here's a link to some quality brands and some of the paraphernalia. Here is a page with more information about the history of Absinthe and the controversial ingredient Thujone. (Thanks Megan).